The holidays are upon us and Black Friday kicked off one of the most successful shopping seasons since the economic downturn. Most people rushed to the major chain retailers for deals and sales. These retailers spend millions of dollars to get your attention and your hard earned money. Local businesses have a hard time competing with the advertising dollars of these large companies but they still deserve your money. There are many reasons for shopping locally. According to the Andersonville Study of Retail Economics, local businesses generate 70 percent more local economic activity per square foot than the big retailers. It has been determined that if you spend $100 at a local business, roughly $68 stays in your local economy. 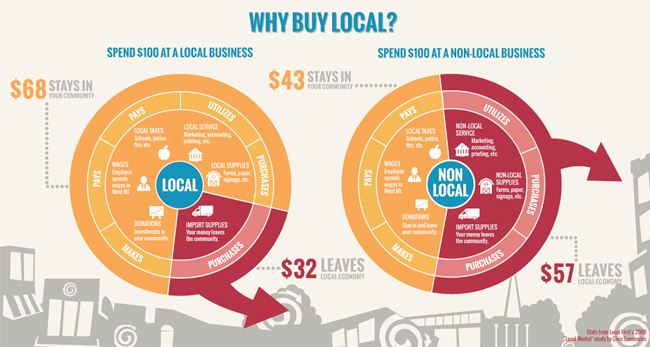 If you spend the same are a large business, only $43 stays in the local economy. Now that Black Friday has come and gone, it’s time to focus on shopping locally within your community. Supporting local businesses is the best way to help support your economy, your neighbors and your local community. We have compiled a gift guide based on local businesses in the Puyallup area to help you when it comes to shopping for your friends and family. Here are some of our favorite picks for both gifts and stores in the area! 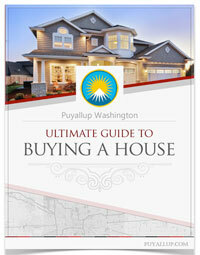 Puyallup is a preferred destination for antique lovers. The Antique District in the historical downtown area boasts seven antique shops with hundreds and hundreds of dealers. For all those antique lovers in your life, there is no better place to find that unique vintage collectible than the Antique District. The aptly named 3rd Street Antiques on 3rd Street in the city has 15,000 square feet with 80 vendors. Victoria Sells Antiques has 10,000 square feet with a total of 80 vendors. Pioneer Antiques & Accrete Lighting on South Meridian not only sells a variety of antiques but Accrete Lighting has been offering quality replacement lamp and fixture hardware and parts to the antique community since 1986. Just a Memory, Kings Row Antiques and Collectibles, Her Shabby Chateau, and Junk and Disorderly Antiques and Gifts are more antique stores that carry a wide variety of collectibles, treasures, and antiques. Friends and family members hunting for a gift for loved ones with a green thumb are lucky to have such an amazing nursery and gift shop like Watson’s. Not only does Watson’s carries a wide variety of trees, shrubs, Watson’s grown annuals, seasonal annuals, perennials, houseplants, veggies, herbs, seeds, and roses but they also have a wide selection of gifts and home décor. There are also practical gifts for the gardener in your life like tools, gloves, sloggers, soil, compost, fertilizers, pots and containers. Watson’s is an amazing place to find a gift for all those gardeners and if you are truly stumped, a Watson’s gift card is sure to be appreciated. The holidays are the time to give not only gifts but to help those in need. The Nook is a charity boutique, operated by St. Francis House. So when out looking for a gift, the St. Francis House is a great place to find something and to donate to your community at the same time. St Francis House receives many “high-end” items beautiful, one-of-a-kind item like unique home décor, lovely jewelry, amazing china, silverware, vintage items, gently used and new clothing, books, artwork, furniture and more. The Nook is the best place to go on a treasure hunt for the perfect gift for a loved one for the holidays. Proceeds from The Nook go directly back to supporting the programs of St. Francis House. Come support the needy in your community by shopping for your holiday gifts at the Nook! Jewelry is one of the best gifts to receive for the holidays. Johnson Jewelers in Puyallup has kept its doors open for over 100 years and has a reputation for being one of the best jewelers on the west coast. The jewelry store is located at 103 South Meridian and has been operated by the Johnson family for four generations. This long-time family business has been delighting the hearts of fine jewelry lovers in the city for generations. In addition to watches and bridal jewelry, the shop owners also have their own line of custom creations that are exceptional and very high quality. Foodies in the area love My Cheese Shoppe in the downtown district. The store which opened last June carries so much more than specialty, imported, domestic & artisan cheeses, they also have a wide variety of delicious artisanal treats including natural salami, raw honey, Spanish date & walnut bread, handmade artisan local caramels, handmade local artisan toffees, organic dark chocolates, fig spreads, peppadews, and more. They have more than 75 types of cheese in stock, which happens to be one of the largest selections of cheeses in the Pacific Northwest. Their main focus is on selling what they consider “clean cheeses” and those are cheeses that have not been processed. They only offer cheese that does not have artificial dyes, and the smoked cheeses smoked with wood chips or walnut shells, not liquid smoke. They are committed to educating their customers about good cheese and have generous tastings for customers that are looking to expand their taste buds. Pick up some delicious tasty treats for those picky foodies in your life. Pet Lovers and their pets can be difficult to shop for but have no fear, The Dog Daze Natural Pet Market is dedicated to providing natural pet supplies like foods, treats, and supplements for dogs, cats, and small animals. Come by and pick up some amazing natural products for all those animals in either your life or a loved one’s life. Your dog or cat also deserve presents for the holidays. The Dog Daze Natural Pet Market firmly believe that natural products along with providing exercise and positive affirmations will help your pets live longer, happier and much healthier lives. Give the gift of a love and life to your pet or to some who considers their pet a part of the family. Wine Décor and More is located on North Meridian in Puyallup is the best place in the city to find exclusive hard-to-find wines that make for the best gift for the wine lover in your life. They currently focus on curating exclusive small production, hand crafted, and family-owned wineries from Washington and Oregon and they stock over 60 different wines from over 20 wineries. They have amazing wine gift baskets that include both bottles of win and food items. Baskets include crinkle filler, shrink wrapped, a beautiful bow, a small card, wine and food items. Wine chosen for baskets must be purchased from Wine, Décor, and More. Currently they have wines from the following wineries: Airfield Estates, Angel Vine, Benson Vineyards, Christopher Michael, Covington Cellars, Ginkgo Forest Cellars, Guardian Cellars, J Scott, Kerloo Cellars, Kontos Cellars, Lone Birch, Lupine Vineyards, Naches Heights Vineyard, Nathan Gray, Paul Rin, Robert Ramsay, Smasne Cellars, Sonoris, Spindrift Cellars, Trust Cellars, William Church and Woodinville Wine Cellars. Wine, Décor and More carries some amazing gift options for those looking for the gift of wine and more. Gift shopping for the holidays can be hard but make sure that you use this guide to find gifts locally for your loved ones. Shopping locally is a great way to support your community and your local economy. 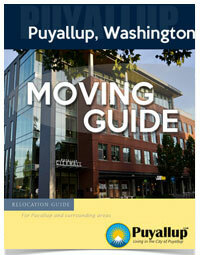 Help spread the joy by visiting these stores in Puyallup. 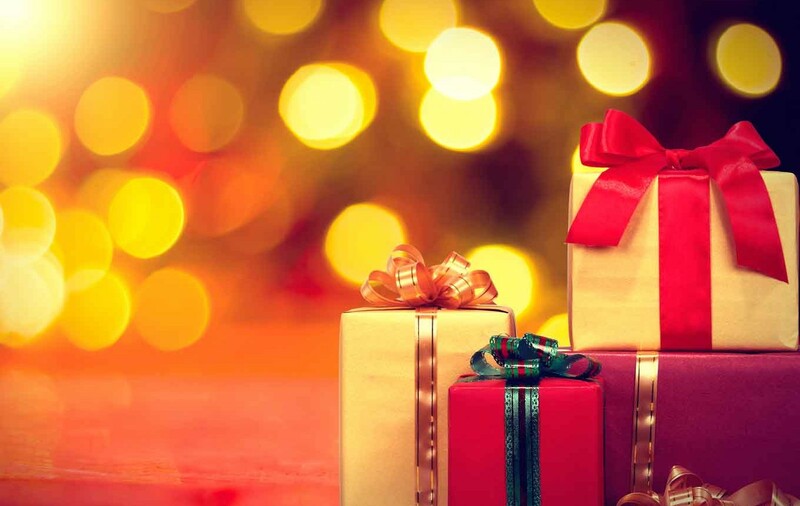 Tweet us and let us know your favorite places to buy gifts in the area!